Original copies of this book, published in 1921, now sell for well in excess of £200. Now followers of Queen’s Park, and students of the history of Scottish football, can purchase this first hand account of the first half century of Scottish football history, for “less than a tenner”. The entire contents of this remarkable book have been faithfully reproduced in a 300 page, softback version. 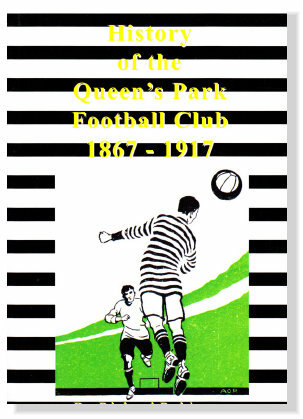 Richard Robinson wrote the first history of Queen’s Park Football Club to mark the club’s Jubilee in 1917. It was published in 1921, and over the decades, the few remaining copies of the book have become very rare, and expensive to purchase. The contents of the book provide a unique and fascinating account of the first five decades of organised football in Scotland, and, to a degree, throughout Britain ; told by a pioneering football writer from personal recollection, and with access to original documents and records. Topics covered in detail include the birth of the Scottish Cup, the formation of the Scottish Football Association, the establishment of international football, the formation of the Scottish League and introduction of professionalism The book also provides a detailed and authoritative account of the first five decades of the famous football club, and its equally renowned stadia. This reproduction is designed to allow 21st century football enthusiasts and historians to enjoy the unique insights provided by the original book, at an affordable price.